As line of business (LOBs) take on a more influential role in decisions related to infrastructure for their applications, they need to investigate solutions from suppliers such as NetApp. Such suppliers are going to great lengths to deliver solutions that empower developers and application owners to do their jobs by removing critical hurdles they face with their infrastructure. Such individuals and teams need to know that their infrastructure solutions do not expose them to availability, resiliency, performance, or security risks and can deliver on requirements cost effectively. IDC believes that NetApp’s solution will resonate with LOB owners who are constantly struggling to keep their head above water with tight development and go-to-market timelines and who care about what the infrastructure can deliver — application speed, competitive differentiation, better understanding of customers, and so forth. 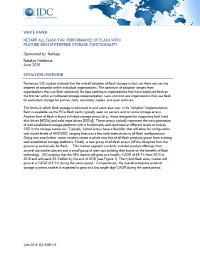 Download this white paper as it examines how NetApp understands the application landscape and is attuned to the challenges faced by lines of business. NetApp’s leadership in the data management and infrastructure market means that businesses can seek to partner with the company for delivering the infrastructure solution for their future application strategy.